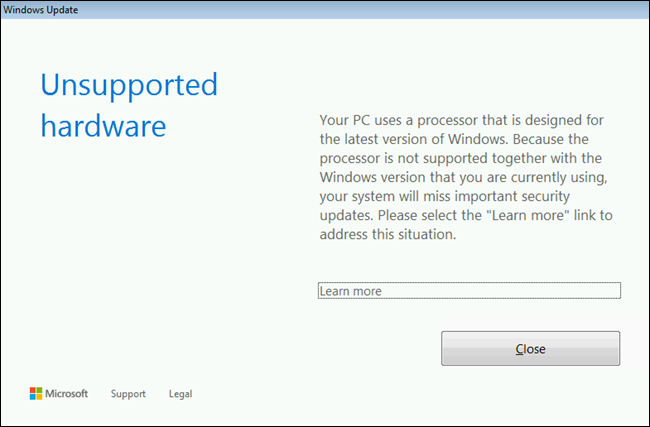 Microsoft doesn’t want you to keep installing Windows 7 (or 8) on new PCs. If you try, you’ll see an “Unsupported hardware” message and your PC won’t receive any security updates from Windows Update. Other hardware features may not work properly, either. RELATED: How Long Will Microsoft Support My Version of Windows With Security Updates? This is somewhat confusing because Windows 7 is in its extended support period, and is officially supported by Microsoft with security updates until 2020. Windows 8.1 is still in its mainstream support period and is officially supported until 2023. In theory, these operating systems should work fine, even on newer hardware. Historically, Microsoft hasn’t enforced any sort of hardware limitations for older versions of Windows. Even after Windows 7 was released, you could continue installing Windows XP on the new PC hardware being released, if you liked. But Microsoft now has a new policy, which they announced at the beginning of 2016. New CPUs will require the latest version of Windows. “Going forward, as new silicon generations are introduced, they will require the latest Windows platform at that time for support,” explains a Microsoft blog post. This doesn’t even just mean Windows 10—it means the latest update to Windows 10, too. This policy is now in place. If you have a PC with an Intel 7th-generation CPU (Kaby Lake) or AMD’s 7th-generation processor (Bristol Ridge or Ryzen), you’ll see an error message and Windows Update won’t offer your PC and security updates. New CPU architectures will have the same limitation going forward. Microsoft initially announced that only some computer models running Intel’s 6th-generation CPUs (Skylake) would be supported with security updates, but most PCs with Skylake would be left out in the cold. This came as a shock, as it was announced after some people had already purchased Skylake PCs and installed Windows 7 on them. However, Microsoft eventually backed off on this threat. Windows 7 and 8.1 PCs with Skylake will continue receiving security updates normally until 2020. Instead, Microsoft is firmly drawing a line in the sand with the 7th-generation CPUs. This policy also applies to Windows Server 2012 R2 and Windows Server 2008 R2. Server PCs will need the latest version of Windows Server to get security updates. Here’s what this actually means: Microsoft won’t provide you with security updates via Windows Update if you install Windows 7 or 8.1 on a PC with one of these modern CPUs. Instead, you’ll see an “Unsupported hardware” message that informs you your PC “uses a processor that is designed for the latest version of Windows”. In other words, Microsoft is saying you should install Windows 10 on these PCs. Windows 7 and 8.1 don’t actually include code that prevent these operating systems from working on the new CPUs. Instead, Microsoft is just blocking PCs with this modern hardware from updating via Windows Update. This official lack of support from Microsoft also means that hardware manufacturers may not bother releasing drivers that enable all the functionality of the new hardware on Windows 7. According to Microsoft, you may also see an error message in the Windows Update window if you install Windows on a PC with unsupported hardware. The error message will read “Windows could not search for new updates”, “An error occurred while checking for new updates for your computer”, or “Code 80240037 Windows Update encountered an unknown error”. In other words, Microsoft is saying Windows 7 is old for modern hardware, and hardware manufacturers have to write extra code to make Windows 7 understand modern chips. All this extra code can introduce problems. Microsoft says it has a commitment “to deliver security, reliability, and compatibility” to Windows 7 systems. “Redesigning Windows 7 subsystems to embrace new generations of silicon would introduce churn into the Windows 7 code base, and would break this commitment,” explains Microsoft. This is all about the level of integration between Windows 10’s new code and the latest hardware platforms, according to Microsoft. The new policy “enables us to focus on deep integration between Windows and the silicon, while maintaining maximum reliability and compatibility with previous generations of platform and silicon.” Microsoft notes that this “is entirely consistent with modern technology trends”, by which they mean smartphones and tablets. Here’s the un-spun version of that explanation: Microsoft and hardware manufacturers want to make a clean break. Microsoft wants to test updates to Windows 7 and 8.1 on all the officially supported hardware. It’s certainly less work for Microsoft to declare new hardware unsupported and stop testing updates on it. New CPU platforms do include major changes to processor power management and other features, so they probably will work best on Windows 10. Hardware manufacturers would also rather just create drivers for Windows 10 rather than developing drivers for Windows 7 and 8.1, too. But it’s not impossible for Microsoft and hardware manufacturers to do this work. Microsoft has never before stopped supporting an older version of Windows on new hardware during its official support period. Microsoft and driver developers could do the hard work to test these updates. Alternatively, Microsoft could just warn users that their hardware will not work fully with Windows 7 but continue to offer updates. But they’ve chosen not to. Blocking security updates on new hardware is something Microsoft has never done before, and it caught people off guard. Ultimately, it doesn’t matter whether or not you agree with Microsoft’s choice not to support old versions of Windows on new hardware. What matters is that you won’t receive security updates if you install Windows 7 or 8.1 on one of these newer CPUs, so you shouldn’t do it. There may be unofficial workarounds, but we wouldn’t rely on these, as things can (and often do) break in these situations. Microsoft could disable the workaround, or bugs in new security updates could cause problems on your system. If you receive the “Unsupported hardware” message from Windows Update, we strongly recommend you install Windows 10 on your computer. This ensures you’ll continue to receive important security updates and your computer will still be officially supported. Businesses and enthusiasts who really don’t want to use Windows 10 should dig up some Intel Skylake hardware, as that’s the most modern CPU that will continue being supported by Windows 7 until its end of life in 2020. In 2020, everyone will be forced to upgrade from Windows 7 to continue receiving security updates anyway—and 2020 isn’t that far off.